I fell in love with chilero when I lived in San Jose, Costa Rica. I make it a bit differently than what is typically found there. In San Jose, every restaurant will have chilero, which is usually a blend of jalapenos, onions, carrots, green beans, oil, and vinegar. I make mine without the added vegetables and use a combination of chile peppers. I love the bright color and bold flavor that results from this combination. It is great as a topping for fish or meat. I also like to add a spoon of it to guacamole for added zest. You can also use it as a salsa to eat with chips. You can adjust the amount of spice by choosing less spicy peppers and adding fewer peppers. However you decide to make it, you will enjoy its incredible flavor. A simple spicy pepper tapenade that pairs well with fish and meat. Also great as a side dish with chips. Slice the peppers in half and place them on a baking sheet. Roast them in the oven until they are blackened. If you have a grill, roast them right on the grill, rotating them to ensure both sides get blackened. Once they are blackened, place them in a plastic or paper bag and tie it to allow the peppers to steam – this makes removing the skins much easier. Allow them to steam in the bag for up to 15 minutes. Remove from the bag onto a cutting board. Be careful when working with the peppers as they do burn your finger – use a bit of plastic wrap or gloves when handling them. Remove the blackened skins, stems, and seeds of the peppers and discard them. Dice up the peppers and place them in a jar. Add the oil, vinegar, and salt. Great as a topping for fish or meat, a salsa, or to add to your guacamole. This super easy blue cheese dressing is a perfect accompaniment to wings or as a dip for chips or veggies. It is also a great salad dressing. And it takes less than 10 minutes to whip together – who could ask for a simpler dip or dressing? Super easy to make and oh-so-delicious tangy blue cheese dressing -perfect for salads or as a dip. Huge thanks to my lil’ sister for asking for my salsa recipe! Despite making over 40 jars of salsa last year, I never did post my recipe! What the?! Well, now you have it! Place tomatoes, garlic, onion, and chiles on the grill. Grill until the skins are charred. Using tongs, flip the vegetables to ensure all sides blacken. Remove tomatoes from grill and place into a bowl. Place the other vegetables in a small dish. Place chiles in a paper bag for 5-10 minutes. Allow tomatoes to cool. Remove skins from onion and garlic. Remove chiles from bag and scrap the charred skin away. Remove the stems and, if you want less spice, remove the seeds as well. Once tomatoes have cooled, remove the skins and cores. Some of the skins may stick – leave them – it is no problem. Place tomatoes, onion, garlic, and chiles in a food processor. Process to desired consistency. Add salt, spices, lime juice, and cilantro. Process for another minute or two. Add more salt or lime juice to taste. Transfer to bowl. Serve. Enjoy. Dress up your halibut with a twist on chimichurri and serve alongside a spicy watermelon salsa. Phenomenal flavors united to excite your taste buds. 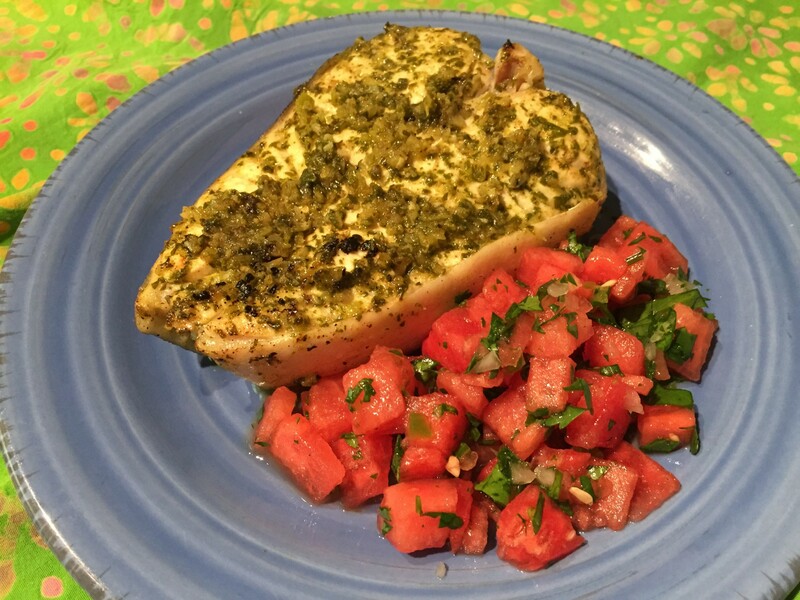 Simple, easy, and delicious halibut recipe paired with a tangy watermelon salsa. Finely grate the zest of one of the limes and add it to the bowl of a mini food processor. Squeeze <g class=”gr_ gr_133 gr-alert gr_gramm gr_run_anim Grammar only-del replaceWithoutSep” id=”133″ data-gr-id=”133″>in </g>the juice of the lime and add the garlic, cilantro, onion, jalapeno, cumin, and salt and pulse until roughly chopped. Continue to pulse as you add 1 tablespoon of the olive oil and more lime juice as needed so the mixture becomes a thin sauce. Place the halibut in a casserole dish. Spoon the sauce on each side of the steaks. Let marinate for 10 to 15 minutes while you prepare the watermelon salsa. For the salsa, combine all salsa ingredients in a bowl. Add more salt and lime to taste. Heat 1 Tablespoon olive oil over medium heat in cast iron skillet. Place the halibut steaks in the skillet. Allow to cook for 5-7 minutes per side, depending on <g class=”gr_ gr_135 gr-alert gr_gramm gr_run_anim Grammar only-ins doubleReplace replaceWithoutSep” id=”135″ data-gr-id=”135″>thickness</g> of steaks. Steaks are done when the fish flakes easily away when combed with a fork. Place a filet on each of two plates. Add a large scoop of watermelon salsa alongside the halibut. You can also place the halibut on a bed of mixed greens and top with the watermelon salsa for a simple salad or chop up the halibut and serve halibut tacos with watermelon salsa.